WEST LAFAYETTE, Ind. — A silk hybrid material attacks bacteria when illuminated by a green light, thanks to a far-red fluorescent protein researchers transferred to its genetic makeup. "Silk is an ancient and well-known biomaterial," said Young Kim, Purdue associate professor of biomedical engineering. "It doesn't have any issues with the human body. And the nice thing about green light is that it's not harmful – the color corresponds to the strongest intensity of the solar spectrum." To combine the benefits of silk and green light, researchers inserted the gene for "mKate2," a far-red fluorescent protein, into a silk host. Shining a green light on the resulting hybrid generates reactive oxygen species (ROS), which are effective radicals for breaking down organic contaminants and attacking the membrane and DNA of pathogens. When E. coli on the fluorescent silk were illuminated by a weak green light for 60 minutes, the bacteria's survival rate dropped to 45 percent. The researchers found that the hybrid could be processed into a solution, film, bandage and fabric. "We've basically added fluorescence to silk to facilitate disinfection or decontamination using just visible light," said Jung Woo Leem, a visiting scholar in Purdue's school of biomedical engineering. 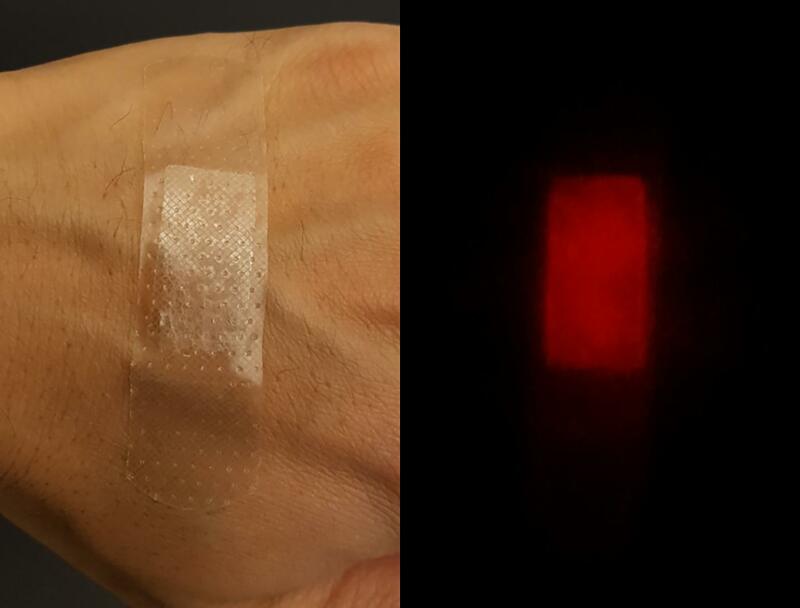 Kim's team believes that green-light activated red fluorescent silk could be both more efficient and scalable than other plasmonic photocatalysts, in which metal nanoparticles hybridized from semiconductor materials also use visible light but could still pose negative environmental consequences. "The silk photocatalysts would be easier and safer to produce than plasmonic ones since silkworms, rather than industrial facilities, provide the host for ROS-generating materials. It's a completely new green manufacturing of nanomaterials," Kim said. Kim's team plans to take advantage of silk's biocompatibility with the human body both inside and out. "We're thinking about some implantable and injectable wound healing materials that dissolve over time in the body. Then we wouldn't need to do additional surgery to take it out," Kim said. The team has filed a U.S. patent application for intellectual property protection and commercialization. Fluorescent proteins often result in phototoxicity and cytotoxicity, in particular because some red fluorescent proteins produce and release reactive oxygen species (ROS). The photogeneration of ROS is considered as a detrimental side effect in cellular imaging or is proactively utilized for ablating cancerous tissue. As ancient textiles or biomaterials, silk produced by silkworms can directly be used as fabrics or be processed into materials and structures to host other functional nanomaterials. It is reported that transgenic fusion of far-red fluorescent protein (mKate2) with silk provides a photosensitizer hybridization platform for photoinducible control of ROS. Taking advantage of green (visible) light activation, native and regenerated mKate2 silk can produce and release superoxide and singlet oxygen, in a comparable manner of visible light-driven plasmonic photocatalysis. Thus, the genetic expression of mKate2 in silk offers immediately exploitable and scalable photocatalyst-like biomaterials. It is further envisioned that mKate2 silk can potentially rule out hazardous concerns associated with foreign semiconductor photocatalytic nanomaterials.